Wow, what a week. I have to say even as employees of Microsoft, we get surprised when we go to our conferences and see some of the bigger announcements. There are things that are being worked on that are new or just in different divisions that we’re not focused on. 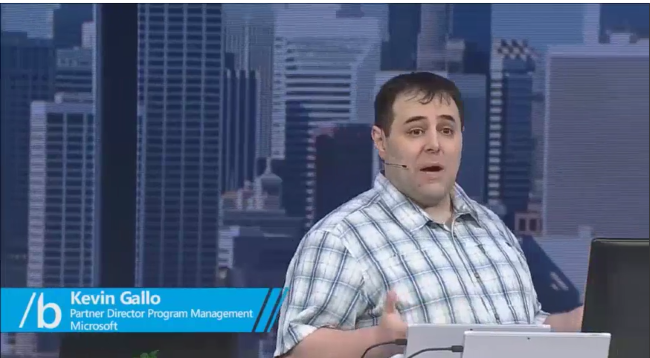 This past week at the Build 2015 conference was an example of that for me. Lots of good stuff for developers from client to server! At Build this year we introduced the Universal Windows Platform v10 with a set of new APIs and unified features for all Windows devices. Perhaps the best vision of this is the Day 2 Keynote where Kevin Gallo walked through an example of this and a single app running on tablet, phone, Surface Hub, HoloLens, etc. Visit the keynote and watch the whole thing or if you want to jump to the start of this portion it starts at about 23 minutes in. A really well done, compelling demonstration of the Universal Windows Platform. One of the things I was really happy to have is part of the Office team come and talk about how they build Office on the same platform we ask you to build apps on. It is good insight into a large application with lots of legacy and goals that might not be typical of smaller apps or smaller ecosystems. A big focus for XAML this release was performance given that customers like Office and the Windows shells themselves leveraging XAML for their UI. I hope that if you are a XAML developer you take some time to look at what new features are available in the Universal Windows Platform for you in Windows 10. As you play around with the bits, please continue to give us feedback. The best way is to be involved in the conversation on the forums. Ask questions there, get help from the community, share learnings, etc. Secondarily the Windows Insider Feedback tool (an app that is installed on Windows already for you as ‘Windows Feedback’) is available for you to give direct feedback to the teams. Please choose categories carefully so that the feedback gets directly to the right team quickly. Thanks for helping make the Windows Platform better. I hope these direct links help you jumpstart your learning!